Hockey books tend to be correctly stereotyped as formulaic pieces of non-fiction. There is a dearth of creative, fun, hockey literature. Here to help fill that void is new author Frank Ewert. 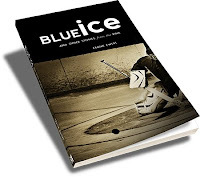 He's compiled a collection of entertaining short stories in his first book Blue Ice: And Other Stories from the Rink . The book is pretty thin. It is just 82 small pages, with just six simple stories. But also contained in this small volume is promise. Promise of a good young writer who I am confident we will hear from again. I suspect he will likely branch out from hockey, though he has found some high praise already from the hockey world. "Frank Ewert not only has a fine feel for the game and it's wacky characters, he has a nice, laid-back storytelling style with a sense of humour," Roy MacGregor is quoted saying on the back of the book. MacGregor of course is one of hockey's most prolific writers, finding great success in the juvenile fiction genre with The Screech Owls series and The Last Season. The book opens with my favorite story, The Protector. It is a first person account of a junior player who's job is to fight so that team's star/jerk does not have to. It is an interesting exploration of the complex relationships every team must handle. Then we move on to the fun story of The Canadian. The Canadian's main character is a child who is actually a dual Canada/American citizen. But the kid grows up in Canada and loves hockey, so he identifies himself as blindly Canadian, even in his cherished with his grandfather back in New York. Taking The Man is a hilarious chapter about a physical in a no contact league that has a serious enemy - the referee. Completely helpless to the referee's calls, the tough guy takes back control in a most unusual way. Blue Ice is a story more about a girl with red hair. Hockey teaches our love-struck hero a little bit about life, love and girls. A Breakaway is quick chapter, as quick as, well, a breakaway. I'm not sure if that was what the author was attempting to do, either way great job. The last story is The Cup, the Stanley Cup of course. Three Calgary Flames fans are determined to steal the Stanley Cup from the victorious Tampa Bay Lightning and bring it home to Canada. They get so close they can touch it, but somehow the Cup contently calms them. The book is beautifully published by Canon Press. Yet it is a curious design in that it the text seems so geared towards juvenile readers. A quick glace at the book does not really suggest that. The book is thin and simplistic, but more importantly it is fun. It is definitely worth a flip through.